Five years ago, I had no idea what the posterior fossa was or where it was or why it existed. Five years ago, Lily began throwing up. It was April. The first time was on a car ride from Miami to Key West. I thought she was car sick. And then it continued--randomly, constantly and without ceasing. 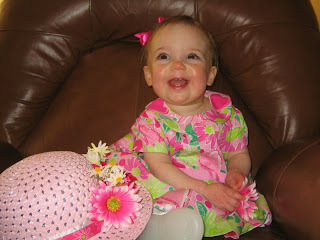 She threw up on her gorgeous pink and green Lilly Pulitzer dress. I still remember the exact spot we pulled off the road to clean her up and my father telling me we could have stayed home if Lily was sick. Then there was the misdiagnosis of a bladder infection. And my frustration with motherhood--every morning I woke to Lily gagging on the monitor and I thought I was not cut out to handle it all. The dress. Five years ago. Five years ago, I never heard of an ependymoma. And I thought the odds of knowing someone with a brain tumor were akin to winning the lottery or being swept up by a tidal wave. Five years ago, the odds were good that we would all be okay. And then, very quickly, the odds weren't in our favor. Lily had a brain tumor--an ependymoma, in her posterior fossa, the back of the brain that contains the brain stem and the cerebellum. Ependymomas occur in adults and children. In children, ependymomas are the third most common type of tumor. Lily's neurosurgeon never told us about an ependymoma--her MRIs indicated something else entirely. When he was able to perform a total resection and remove all of the tumor and then Lily's multiple spinal taps were "champagne clear;" he celebrated. Lily would not need chemotherapy. Chemotherapy is not very effective against Lily's particular tumor type. But it is the only option if tumor cells are floating around in her spinal fluid. And make no mistake: chemotherapy is poison. It destroys good and bad cells alike. The heavy metals destroy hearing and can lead to permanent hair loss and all sorts of permanent ugliness. But, we were lucky. Lily qualified for Proton Radiation--our oncologist fought for her inclusion. Lily was 14 months old; a former preemie with an adjusted age of 11 months. Developmentally, she was not even a year old. And we agreed to brain surgery to save her and then radiation to cure her. She was a baby--and was forced to endure the worst sorts of pain--frequent brain surgeries, needle sticks, daily sedation and radiation right to her precious little brain. So far, it has worked. And I rejoice everyday for her health. And for the opportunity to spread awareness and to search for a cure. Five years ago, I never imagined that I would be who I am now or know what I know. But so many other families are not that lucky. Children die, everyday at the hands of an ependymoma. Attached to the brain stem, the ependymoma becomes inoperable. And everyday, another child is diagnosed with the same tumor. Every day, another family knows what we know. And you know too--if you are reading this--you know. I don't care how rare pediatric brain tumors are or how rare an ependymoma is or how the odds are in your favor. Because you know Lily. Thursday, April 19 is the first ever Ependymoma Awareness Day, sponsored by the CERN Foundation. The Foundation will commemorate the day with a butterfly release. The CERN Foundation has one goal: Cure Ependymoma. It researches cures, causes and treatments for ependymoma tumors in both children and adults. It continually amazes me what you went through and how strong you are. I mean, it AMAZES me. Your strength, positive attitude and willingness to give back is inspiring! Hug Lily and Chloe extra tight today! Great testament to the strength of your family! So glad CERN directed me to your site. I feel you! 15 months ago, I had no idea what a Ependymoma was or that there are different grades. My son was not as lucky, he needed Chemo and Radiation after a total removal of his tumor. He is cancer free now, and we hope it stays that way, forever! It is time that we learn more about the Ependymoma and the Cern Foundation is doing a great job! I wish Lily and the entire family the best forever! It is nice to know, that even though this tumor is very rare, we are not alone. Hurrah for Cancer-Free and thank you!